I had the pleasure of hosting a bridesmaids’ luncheon a few weeks ago. There were two friends that served as hostesses with me. We had such a magnificent time planning and thinking about food and settings for a summer event. We decided on blue and white china with white linens. White looks so crisp and cool in summer months, and it is the perfect backdrop for any china pattern. Fresh hydrangeas from the yard made the perfect centerpiece. The party experts at Celebrate Magazine created a kitchen-themed bridal shower full of fun details perfect for a summer gathering. That was the easy part. Selecting a menu was more challenging. What do you serve in summer that is fun and easy to prepare ahead? I have a favorite recipe for chicken that is a great luncheon dish. We all call it “Party Chicken,” and I am sure it has many names, considering it is THE recipe passed from one lady to another. The chicken breast nestles on a bed of dried beef with a scrumptious sauce, and you can assemble it very easily. Just serve it over rice! Line a 13x9-inch casserole dish with dried beef slices. Place chicken breasts on top. Mix the sour cream, soup, and consommé together, and pour over the chicken. Sprinkle with paprika. Bake for 2 hours, remove from oven, and sprinkle bread crumbs over chicken. Return to oven for 20 minutes more. You will love the sauce that forms in the casserole dish. It’s delicious! We served ours with a salad and marinated carrots. What is your favorite dish to serve for summer occasions? Phyllis, Almost 50 years ago, when I was a new bride in Newport News, this was a standard luncheon fare at St. John’s Church. It was wonderful, and I had forgotten about this great, simple, and make ahead recipie! Thank you so much. My fa,ily and many others will be enjoying it soon. My mother was from Collins, Mississippi and I spent all my summers there with my grandmother. I always enjoy serving my grandmothers shrimp salad. It is always a hit and reminds me of long summer days in Mississippi. Thank you Phyllis! I, too, have NEVER heard of dried beef but can’t wait to try your recipe. This is a very popular recipe in my family however, we call it Company Chicken. The other difference is in our recipe you wrap a piece of bacon around the chicken breast and lay it on the bed of dried beef. Either way it is a wonderful recipe. Thank you for sharing your life with us. So many choices for summer luncheons , but I love to prepare a Greek Salad served on a large,decorative platter . Fresh tomatoes , cucumbers , onions , olives and good quality feta cheese- all topped with homemade dressing . Salad Nicoise also makes a beautiful presentation for summer guests ! Your chicken recipe is similar to mine – a recipe from the 1970’s ! My ingredients include white wine in the sauce (instead of beef consommé) and the chicken is “wrapped” in the beef . Delicious, as the chicken bakes slowly at 200 degree temp . Comfort food reminding me of the early days of our marriage . It’s me again,Phyllis. Forgot to tell you that I made the confetti cake for a friend’s birthday. She was thrilled…thank you so much for the recipe. Chicken salad with a spicy chile mayo served on crusty bread, cucumber and dill salad on the side and a sour cherry coffee cake a la mode is a summer standby for me. 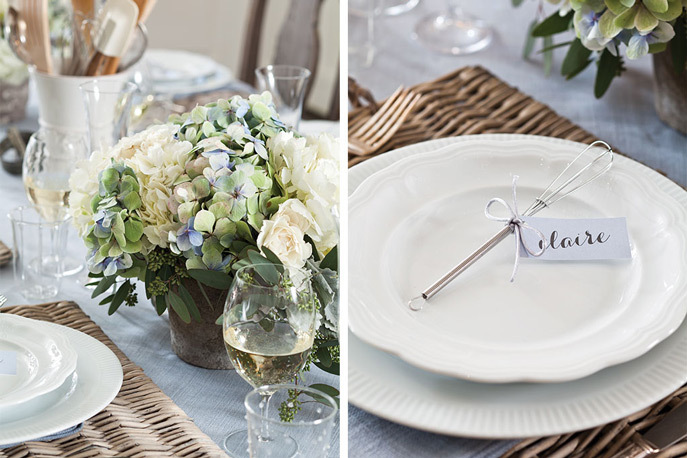 The table setting for the bridal shower looks so exquisite yet simple…beautifully done, Phyllis! Thank you. I’m in the foothills out of Sacramento. I have a new ingredient to try! Living in Florida, the summers are hot and humid so our luncheons are indoors. My favorite luncheon is crab quiche, fruit salad, rolls and coconut cake for dessert. In the winter, I serve pasties,(pasties are from the UP of Michigan where I am originally from) vegetable salad and trifle for dessert. At our church for our Fashion Shows, we always have Chicken Salad because everyone likes it, I think I will tell them about your recipe to be different, as it sounds so good. This is a lovely tablescape, Phyllis. You and the other hostesses did a wonderful job. The bride will forever remember and cherish those memories. 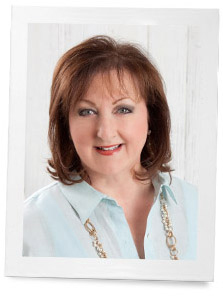 I remember my bridal luncheon down to the tiniest detail, and that was almost 41 years ago! I can’t wait to try the recipe. It sounds simple and delicious..my favorite kind of recipe for any occasion. I didn’t think that there was a variation on chicken casseroles that I had not seen; but, dried beef & beef consommé? Sounds intriguing. Must admit chicken salad is always my favorite for summer. Made with roasted chicken from the deli, it’s both uncomplicated and delicious. Yesterday, at a salad luncheon I attended, among the scrumptious offerings, someone served a cornbread salad. Delightful! on hubby, he loves casseroles. Did order the celebration Birthday magazine and sever others I could not resist. What is ‘dried beef’? Is it something only found in the south? Is there a substitute for those of us in the west? Thank you. It’s also called chipped beef – I think the brand I used to see was McCormick, At any rate it was sold in a glass jar and in the store it should be shelved where the canned stew, chicken, ravioli etc. is. Very vintage cuisine! Party Chicken was a recipe my mother-in-law passed to me many, many years ago. It is a wonderful celebration dish and is easy to create. I must say I had forgotten what a good choice it can be. Thank you for the reminder. The table looks inviting also! This seems to be the summer for brides for us. We are hosting a party in August and have done several others this summer. 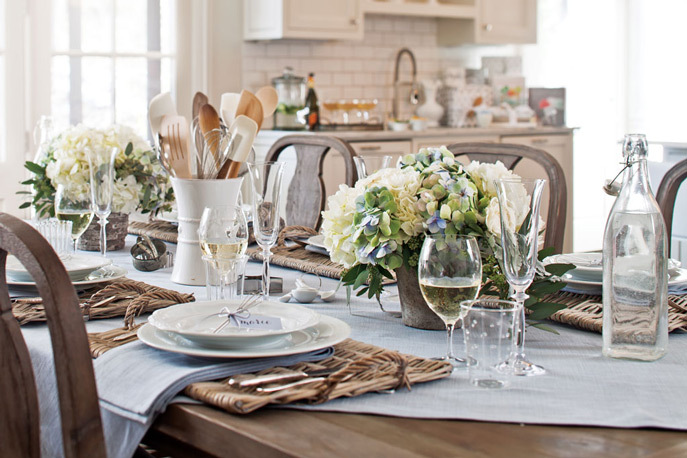 Love your beautiful table – perfect for the occasion and can’t wait to try your recipe! Happy weekend! Phyllis, your luncheon looks beautiful. I too love hosting showers, luncheons and teas in our home. This summer I’ve blogged about some delicious recipes, my favorite go to luncheon food is usually a beautiful chicken salad, with lots of fresh vegetables tossed in. Here at the coast in California we don’t have air conditioning and most of our summer gatherings are outdoors, so our menus tend to focus on fresh salads, fruit, cheese and baguettes, and a few amazing desserts. I will enjoy the dish. Thank you. I have recently received my first copies of Tea Time and Southern Lady. Both have been read, reread, turned over, and thumbed through. I am so happy to have subscribed!